"Fantastic...a work of an insane genius." At last a movie for anyone who ever wanted to be someone...else. Craig Schwartz (John Cusack) an unappreciated puppeteer takes a filing clerk job on the 7 and a half floor of an office building. Bored with his ten-year marriage to Lotte (Cameron Diaz), he becomes obsessed with the beautiful Maxine (Catherine Keener), who rejects him. Dejected Craig retreats into his office. In a moment of exasperation Craig slams a filling cabinet and discovers a passageway. Sucked through a dark, wet tunnel, Craig then realises that he has just discovered an all-access pass to the unique experience that is...John Malkovich! 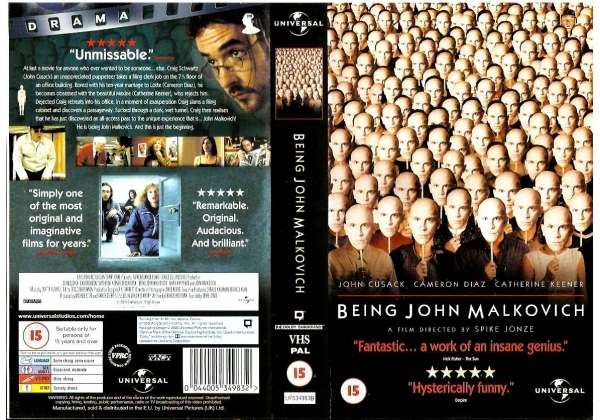 Or find "Being John Malkovich" on VHS and DVD / BluRay at Amazon.